See this is the kinda stuff that happens when i decide to sleep all day and stay up all night, there is no Music Friday:( boo! But i promise to do better by you Gabbyluvs, i will make sure Music Friday is always up on Fridays! But every Saturday needs a music, and therefore ur gonna get that. Hey Monday gets many comparasions to Paramore ( One of my favorite artists and bands), strictly because Cassadee Pope is the only girl in a group full of boys. 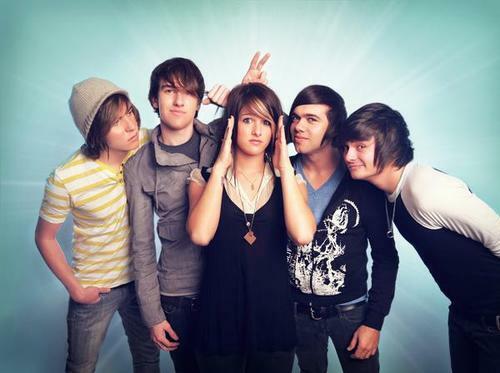 Now, until this week, i never was a heavy Hey Monday fan, because to be honest i heard of them but never gave their music a real listen. I was just randomly searching and came across the video 4 "I Don't want to dance". The song had to grow on me, but now i love it. After that i found "Wish you were here" and "Candles" and from that i became a fan. I've known about Aaron Fresh for a good while now. But i shall reveal a secret, sometimes i hear songs and i don't like them, then i see the video or hear them again and i like them. That's what happened when i first heard "Spending all my time" from him, i didn't really like it but it still ended up on my Itouch. Then when i was doing my daily "Get rid of songs to make space" sweep, i deleted it. Then the music video came out and i denied it until finally it was my new favorite song! Did i mention that he has some crazy dimples? yea no? (Cue Biggie voice) if you don't know now ya know!